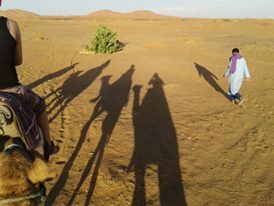 2 Days Desert Trips from Marrakech to Zagora desert . During this trips of 2 days 1 Night from Marrakech you will explore the atlas mountain and desert of zagora . After breakfast in Your riad or Hotel we will pick up you and drive toward the high atlas moutain exploring the landscap of Morocco the colorfull villages making stops in the panoramique views for pictures a facinating stop at the high point 2260 Metres , than we will contunued until the ait ben hadou kasbah the fortificated kasbah the world heritage site by the unesco at 1987 we will vsiite the kasbah than have lunch there and we contunued to the studio hollywood of Morocco the taourirt kasbah ,After a 4 hours drive your camels will wait you equiped with all necesary for the desert trip you will ride the camels arrive to the camp hav a welcomed tea from the hopistaity see the sunset and at night dinner and folcklor music with the berber drums . After the breakfast we will drive toward the valley of draa destination of Marrakech we will arrive at midl atlas mountain have lunch and arrive Marrakech at evening end of the trip .